Big news in the art quilt world recently is that an art quilt just won a HUGE prize in a competition in which it was pitted against art in all mediums. The winner is Anne Loveless, of Frankfort MI; the competition is ArtPrize, held in Grand Rapids MI; and the prize is an astounding $200,000, said to be the world’s largest art award. The competition has been going on for five years and is in two parts: one where the winners are chosen by public vote, and one where a professional art jury selects the winners. Apparently the public section is something like the Oklahoma land rush, where the Sooners lined up in their covered wagons and sped into the sunset to grab the best plots for homesteading. 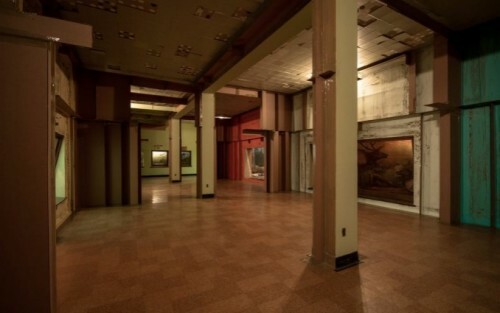 Any artist in the world can enter the competition, as long as he or she finds a place within three miles of downtown Grand Rapids to display the work, and jockeying for good space begins many, many months before the competition opens. This year there were more than 1500 entries. Once the work is installed, anybody who wants to visit can check out the art and cast a vote during the 19 days of the event. After a week they announce the Top 100, Top 50 and Top 25; towards the end the Top 10 are named and there’s another round of voting. The winning quilt had to overcome a huge setback near the end of the competition when the federal government shutdown closed the Gerald Ford Presidential Museum. 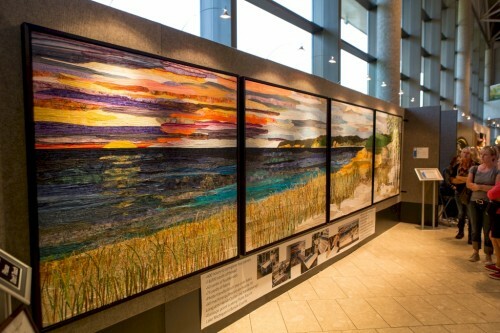 The quilt and three others in the top ten had been displayed at the museum, a prime location for the competition. For the last several days of the event, Loveless moved her quilt to a tent outside the building, and slept there to guard it, and to lobby visitors for their votes. The fact that a quilt won the big prize was received by the art quilt community as wonderful news, but what does it mean to the larger world of high art? Perhaps not much. I’m sure she’s right that there will be lots more quilts entered in ArtPrize next year. But I think she and all the quilters who exulted over the news are whistling past the graveyard when they think winning the big one will raise the profile of quilts in the high art world. The professional jurors didn’t give it the time of day, nor did they choose anything that was among the people’s favorites. In fact, one might cynically argue that when a quilt won the public vote, it ensured that the pros won’t look at another quilt for many years. Just as the artist commented above that populism is a revolt against elitism, elitism is a revolt against populism. The jurors went instead for more cerebral installation art. The big winner with the jury ($100,000) was Carlos Bunga, a Spaniard, who made “a site-specific, architectural intervention…that uses cardboard, tape and paint to re-imagine a gallery in the former Grand Rapids Public Museum.” No danger of that one winning the public vote, just as there’s no danger of a quilt winning the jury. Thank you for posting the information on this prize and the exhibit where the award was received. The award dollars will certainly go a long way to giving support for the artist to further explore her art; I do agree with those who question whether this award by itself will make much difference in the art quilt being accepted to art competitions around the globe. Small steps have been made by several artists in the past years with acceptance and awards; the size of this award seems to give the award more weight in the eyes of many and more exhibit opportunities for art quilters does not seem to me to be the result that will roll out from this. Each venue has regulations and rules particular to their agency/facility. It is, in my opinion, going to take many applications by artists to see an observable shift in attitude and acceptance of quilts as art. None of my words are offered to in any way diminish the magnitude of this very fine win in the art world by Anne Loveless. Kudos for her accomplishment. Strictly concerning the judging, I am put in mind of what happens at regular quilt exhibits. How often do you see the Viewers’ Choice Award going to the same quilt receiving a judge’s award, let alone a Best of Show winner? And the fact that artists lobby for votes also skews the results in my opinion. The amount of the award is unbelievable; the way one wins it equally so. As to the issue of “going bigger” to improve one’s chances of winning, I also have to refer back to quilt specific exhibits. Bigger really does wow, and after viewing the art quilts at the APWQ Show in Tacoma a few years ago, I realized I really did need to start working bigger if I wanted my work to have more impact. More of a commitment, more area to work out a design and theme, more attention from the viewer. But bigger does not guarantee better. Is this winning work better in this size than if it were sized like one of her smaller works? She’s probably right that had she submitted something smaller, it would have gone mostly unnoticed. The subject matter didn’t hurt either – a relatively local area that she has reproduced would up the “like” factor for viewers. Still, any time art quilts can hold their own with already accepted fine art media, it is a good thing. well said, although not reinforcing to textile artists. textile as art is not new, however, quilt as art is. Thanks for the article. I live near the event and try to follow the news but had missed the shortlist artist’s post about Artprize which you excerpted. It’s well written and offers some good solutions for making the event better and how each artist needs to balance the conflicting demands of the “elite” vs “populist” audiences. I recommend artists follow your link to his posting, even if they’re never considering entering this competition–provides some good food for thought no matter what medium one works in. At the very least, $200K will give the artist time to create! I’m not sure, without taking anything away from the artist, that this will do the textile art world much good–at least in reading this particular “review”–when i see this : “What goes through the mind of most non-expert viewers, I would suspect, is a wow factor, an immediate acknowledgement how difficult and time consuming it was to produce the work, coupled with a keen appreciation of the talent that went into its creation. Thus a vote is given, not only because the viewer may “like” the piece, but also as a reward for the diligence and craft that went into creating it.” It seems a rather backhanded compliment to acknowledge the talent and then to presume that the “average” viewer/voter found the length of time to create was what made it art. Then again, time spent in creating something “usually” predicates knowledge, skill in one’s technique and skill and commitment in interpreting one’s vision, so one can hope that this WILL make a difference in the art world for Textile as Art. Arlee — I think you have perfectly interpreted these comments by a High-Art artist (whose work was not one of the people’s choices, although the professional jurors liked it). He is saying that the ordinary people who see this work give brownie points for it being big and taking a lot of time. Reading between the lines, I think he’s also saying that this is not a valid criterion for judging the worth of a piece of art, and by extension, the people’s choice award isn’t a valid judgment. And by further extension, winning the big prize won’t do squat for this particular artist or for textile art in general, as far as acceptance in the world of High Art. I must say I tend to agree with him. Kathy, thank you for putting this story together for us. Perspective is always so important, as is context. And now we can all rest easy and go back to doing what we love, being in the process and with any luck at all, perhaps making an impact in a large or small way. An interesting tale. It seems to be impossible for art critics to accept that good art can be popular. In the UK the sculptor Antony Gormley has been criticised for his huge largely popular public sculpture Angel of the North. In his recent series of lectures the artist Grayson Perry, himself sometimes criticised for perhaps courting popularity with his flamboyant cross dressing, did mention that a serious art critic had labelled David Hockney’s overwhelmingly popularly successful exhibition at the Royal Academy one of the worst exhibitions. Elitism I suppose maintains the exclusivity of the high price – while popularity devalues the currency. I think, however, that the very best artists, the greatest artists make work that is both of outstanding long lasting historical artistic value, and are popular too – if not immediately, or in their lifetime, then in time. I think it is wondrous if that popularity coincides with the artist’s life, so that they can bask in the glow. If contemporary art is increasingly becoming a manifestation of events, then I guess this latest pair of competitions fits right in – an appropriate winner for each camp.